Celebrating the life of Robert E. Norvell, Sr.
Obituary for Robert E. Norvell, Sr.
Robert Eugene Norvell, Sr. was born July 4, 1934 in Crawfordsville, Indiana to Clyde and Beatrice Norvell. Robert was retired and resided in Deltona, Florida since April 2001 with his wife Mary Catherine Norvell. Advent/Fish Memorial Hospital in Orange City, FLorida. 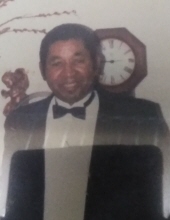 He leaves to cherish his memory; 4 sons, Robert Norvell, Jr(Michelle),Harker Heights, TX, Dane Norvelle(Debra), Memphis, TN, John Norvell(Judy),Memphis, TN, Clyde Norvell, Atlanta, GA, Grandaughter, Shonda Johnson, Deltona, FL, Brother, Jerry Norvell, Crawfordsville, IN, Sisters- Lottie Norvell, Indianapolis, IN, Rosie and Ellma Norvell, Crawfordsville, IN; a host of nieces, nephews and other sorrowing friends. He was preceded in death by his parents, Clyde and Beatrice Norvell and his wife, Mary Catherine Norvell. Visitation Hours, Monday, April 8th, 4-7 p.m.
To send flowers or a remembrance gift to the family of Robert E. Norvell, Sr., please visit our Tribute Store. "Email Address" would like to share the life celebration of Robert E. Norvell, Sr.. Click on the "link" to go to share a favorite memory or leave a condolence message for the family.